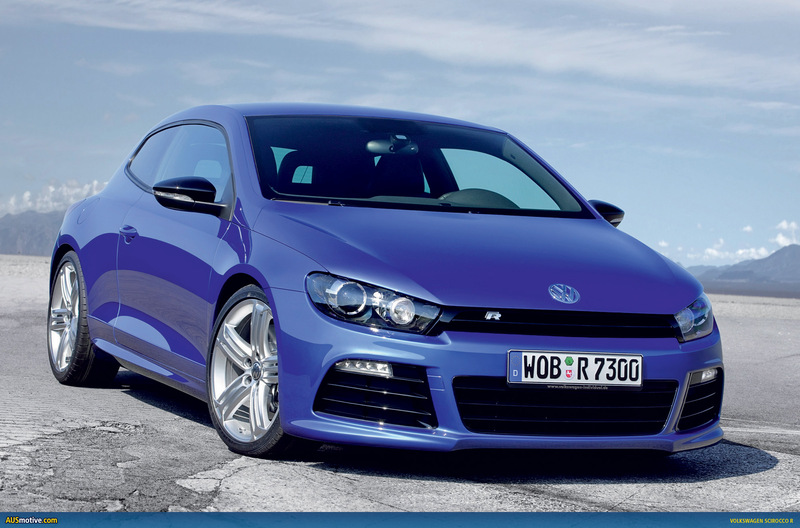 Full details of the Scirocco R, based heavily on last year’s Studie R show car, have now been released. A quick snapshot reveals the Scirocco R will have 195kW/350Nm and will, somewhat disappointingly, be driven through the front wheels only. Let’s hope Volkswagen’s Haldex 4MOTION system is being reserved for the über GTI. While the engine is effectively shared with the Audi S3, perhaps it is FWD that is responsible for the 0-100km/h time being almost a second slower than Audi’s quoted time, with the ‘Rocco covering the sprint in 6.5 seconds (6.4 for DSG). That’s the crucial info out of the way. The material provided by Volkswagen is comprehensive, so rather than giving an overview here, why don’t you follow the jump and take in the extra pics and press release. UPDATE 18 October: Three new pics added after the jump. It is certainly the perfect venue for the world premiere of a new sports car: the Nürburgring. On May 23, at the legendary 24 hour race held there – the toughest in the world – Volkswagen will be presenting the new Scirocco R. Power: 195 kW / 265 PS. Character: genuine sports car. Performance: at its fullest. Handling: just like it should be. Fun factor: maximum. Market launch: sometime in 2009. The Scirocco R – conceptualized by Volkswagen Individual – is an impressive performance package with a brilliant engine and chassis, unique looks and exclusive features. Instead of the usual six-cylinder used so far in R-models of this segment, a boosted four-cylinder TSI is being used in the new Scirocco R. Its advantages: very high power and torque values with significantly reduced fuel consumption. On average, just 8.3 liters of super unleaded flows to the combustion chambers via direct injection per 100 kilometers of driving. That corresponds to CO2 emissions of 194 g/km – top values for a fast 250 km/h (electronically limited) sports car. Scirocco fleet at the start in 24 hour race: Volkswagen plans to demonstrate once again at the 24 hour race just how much dynamic potential the Scirocco R possesses. An entire fleet of two-door cars, five cars altogether, will enter the marathon ride through the “Green Hell” there; all of them bear a close resemblance to the production vehicle, both technically and visually. 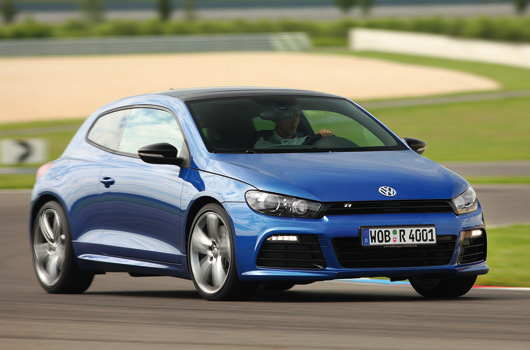 Gas in a literal sense: Three of the Scirocco GT24 versions are powered by a TSI gasoline engine with 315 PS. Two other Scirocco GT24 cars carry the additional CNG label, designating Compressed Natural Gas, because their TSI is fired with very cleanly combusting natural gas – an exception in car racing. 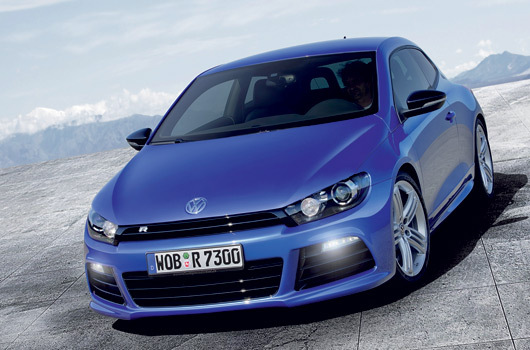 The 300 PS Scirocco GT24-CNG cars have extremely low emissions. After winning and putting its stamp on the Dakar Rally with the Race Touareg powered by a fuel-efficient TDI (direct-injection diesel), Volkswagen is now taking up the issue of sustainability in the Scirocco GT24 as well – and emphatically – on the race course. 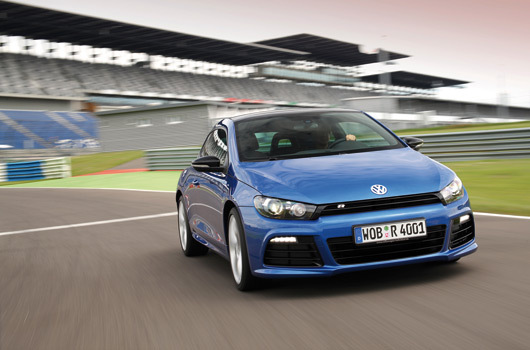 Scirocco R – from car racing to the street: This is not the Scirocco’s first race of this type. This Volkswagen was shaking up the racing field on such occasions as far back as the 1970s. And in 2008, professionals the likes of Carlos Sainz and Hans-Joachim Stuck rocketed two Scirocco GT24 cars to a dual victory in its class. In 2009, things will be even more exciting. Because for the first time, the event offers an opportunity to take a good look at the street version of the racing cars in the form of the new Scirocco R. The first production cars will be produced later this year; with a manual six-speed transmission or – as in the Scirocco race vehicles – with the optional DSG 6-speed dual clutch transmission. Always aboard as standard equipment on the front-wheel drive vehicle: the XDS electronic transverse differential lock on the front axle for attaining optimal traction performance; this system was introduced for the first time on the new Golf GTI. About one year after the market launch of the third generation Scirocco and the dual victory on the Nürburgring track, the new R-version is going to the starting line as what is certainly the most powerful production Scirocco ever built. To attain the very high specific power in the 2.0 TSI (97.5 kW / 132.5 PS per liter displacement), Volkswagen decided on a turbocharged gasoline direct-injection engine known internally as the EA113. More dynamic performance by clever downsizing: Like all TSI engines, the R-version too combines the efficiency of direct injection with the power of engine boosting. Despite downsizing the engine displacement and number of cylinders, the 1,984 cm3 sixteen-valve, four-cylinder engine develops significantly more power (+ 15 PS) and torque (+ 30 Newton-meter) than the six-cylinder engine of the most recent Golf R32. 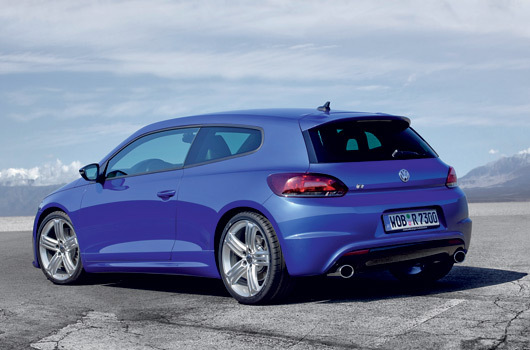 Specifically, the 2.0-liter TSI in the new Scirocco R attains a maximum power of 265 PS at 6,000 rpm. Its maximum torque – a hefty 350 Newton-meter – is available over an immense range of engine speed: 2,500 to 5,000 rpm. This makes for agile responsiveness of the engine, which is able to spontaneously summon torque in the blink of an eye in practically any speed range. The engine’s acoustic output impressively underscores its special kind of power development. 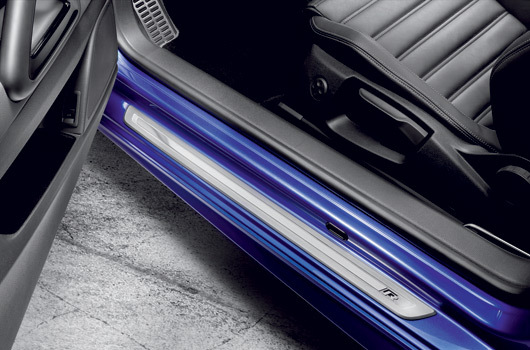 The exhaust system itself is designed as a double-flow system. 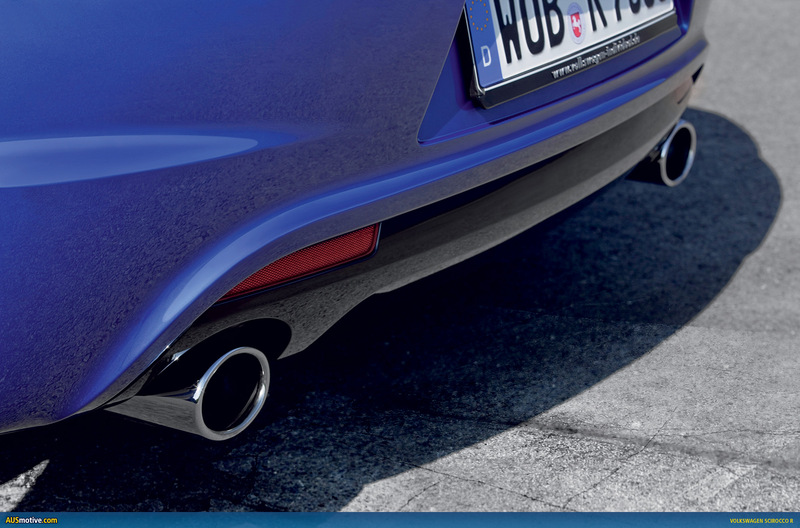 Oval chrome tailpipes extend out from the bumper, one on the left and one on the right. Engine of the Year for the Scirocco R: The in-line four cylinder, which has already earned four “Engine of the Year” awards, builds up its powerful torque via a turbocharger (up to 1.2 bar boost pressure) with intercooling. The engine, weighing in at just 152 kilograms, is controlled by fully electronic engine management with E-gas. The four cylinder’s pistons have bolts with higher strength compared to less powerful versions. The connecting rods were also designed to be stronger, to reliably transmit the engine’s high torque to the crankshaft. Because of the hefty engine forces that are generated, the cylinder block itself was reinforced as well. All of this has a highly dynamic effect: The lightweight 1,333 kilogram Scirocco R needs just 6.0 short seconds for the intermediate sprint from 80 to 120 km/h in fifth gear. It is precisely this type of driving, with a sensation of the build up to maximum torque that is “felt” right from idling, that distinguishes this sports car. It is an impressive, cool cruiser for every route and day of the year. Yet, those who downshift and give the car full throttle awaken a second side of the Scirocco R: a wild beast that sprints from a standstill to 100 km/h in just 6.5 seconds, that is not electronically limited until it reaches 250 km/h and 6,320 rpm, and that accomplishes the classic 1,000 meter sprint in 25.9 seconds. It is a given that this Scirocco will also have an optional dual clutch transmission (DSG). 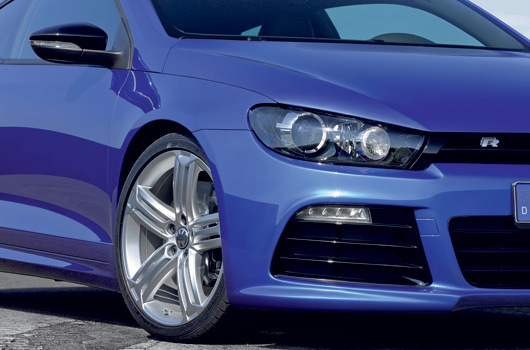 Those who choose the innovative 6-speed DSG will experience an even faster sprinting Scirocco R: the 100 km/h mark drops down to 6.4 seconds here. As is so often the case with a DSG, gains in dynamic performance (and comfort) are by no means purchased at the expense of fuel efficiency or emissions. In fact, the opposite is true, as demonstrated by its 8.2 liter average fuel consumption and 192 g/km CO2. Volkswagen will launch the front-wheel drive Scirocco R with a specially tuned sport chassis and XDS electronic transverse differential lock as standard equipment. The latter refers to a functional extension of the electronic differential lock (EDS) that is integrated in the ESP system and eliminates any type of traction loss. XDS compensates for understeer: As soon as the intelligent electronics detects unloading of the front wheel at the inside of a curve in fast curve driving, the ESP hydraulics applies braking pressure at this specific wheel to restore optimal traction. So, XDS acts like a transverse differential lock that compensates for the typical understeer of front-wheel drive cars in fast curve driving. The driving behavior of the already agile Scirocco R is made significantly more precise and neutral thanks to XDS. Chassis layout from production: In front, the Scirocco R has a McPherson suspension for precise tracking and balanced comfort properties. In the rear, it is a four-link suspension that convincingly meets the challenge of achieving chassis tuning that is sporty yet comfortable. DCC optimally resolves dilemma between comfort and dynamics: As an option, the Scirocco R will also be available with DCC Dynamic Chassis Control. This system continually adjusts damping of individual wheels to roadway conditions based on signals from three body sensors and displacement sensors for each wheel. During acceleration, braking and steering processes, chassis damping is stiffened in fractions of a second to optimally meet vehicle dynamic requirements. By making these automatic adjustments, DCC significantly increases comfort in driving situations that are less challenging dynamically, resolving the conflict in goals between a stiff sporty tuning and a comfortable one. Besides the “Normal” DCC mode, the driver can also choose the “Sport” or “Comfort” mode. New R-wheel styling: Standard equipment includes newly designed 18-inch alloy wheels (“Talladega” type) with size 235/40 tires. An optional 19-inch version of the same wheel type is also offered. Both wheel-tire combinations support the maximum attainable transverse dynamics of the new sports car. 17-inch braking system for maximum deceleration: The braking system was also modified to handle the Scirocco R’s higher level of driving performance. That is why a 17-inch system is used, instead of a 16-inch system; all four brakes have ventilated disks and R-specific brake calipers painted in glossy black. In front, the disks have a diameter of 345 millimeters, and in the rear 310 millimeters. The electronic stabilization program (ESP) was also modified. A new Sport mode can be selected by pressing the ESP button. This makes the ESP respond later in very fast driving on roads with lots of curves – e.g. on a race course – for handling that is even more agile. 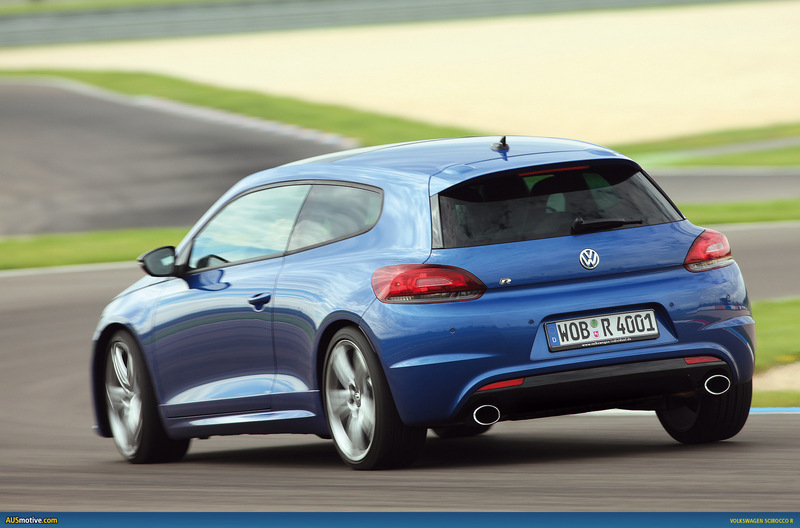 The electro-mechanical power steering of the Scirocco R was also given a sportier tuning curve. 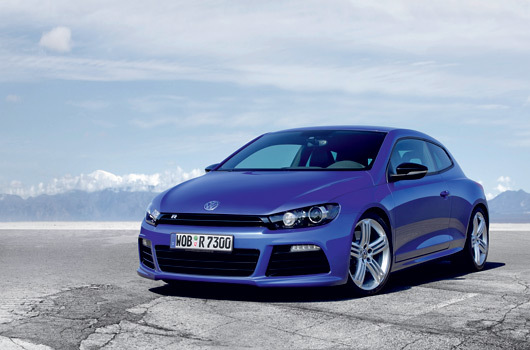 Visually, many aspects of the Scirocco R follow the lead of the GT24, the Scirocco designed for car racing. Front end with LED daytime running lights: The front end design reflects the motto “form follows function”; it has three large air inlets with large louvers in the specially designed Scirocco R bumper that engineers designed for optimal cooling of the brakes and engine. Integrated to the right and left of the outboard air inlets are newly designed and standard LED daytime running lights. The narrow, unique radiator grille screen is styled in a high-end glossy black. 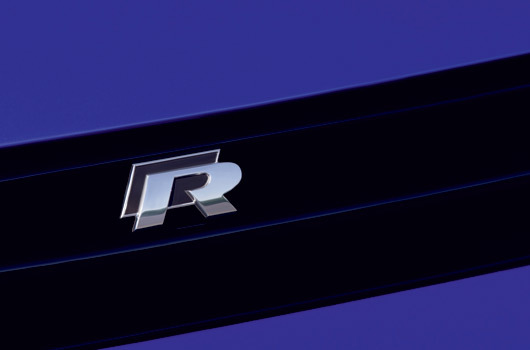 Here (as on the tailgate) the strongest Scirocco of all times can be identified by a new R-logo design that it sports in chrome on a black background. Providing for perfect illumination of the roadway, meanwhile, are standard bi-xenon headlights with integrated turn signal lights. Rear end with double-flow exhaust system: Compared to all other production Sciroccos, the rear image of this car is dominated by a considerably larger roof edge spoiler and a prominent glossy black diffuser in the lower area of the bumper that shows typical R-design styling. 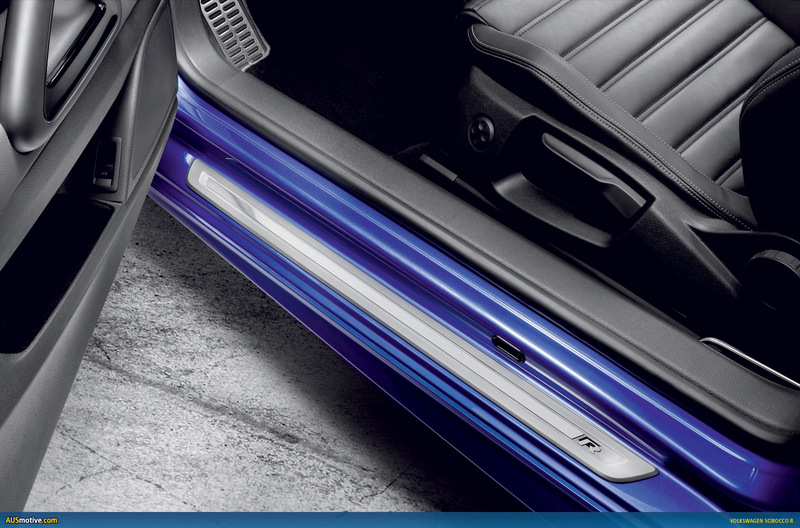 Both of these components – diffuser and roof edge spoiler – reduce aerodynamic lift at the rear axle. Stylistically, the oval chrome tailpipes of the double-flow exhaust system are harmoniously integrated into the overall design of the rear. One tailpipe on the left and the other on the right define the border between the black diffuser and the bumper painted in car color. In addition, the taillights of the new Scirocco R were given a smoked tint. Side profile with new R-wheels: The side view is characterized by powerfully styled side skirts painted in car color as well as new “Talladega” style alloy R-wheels in 18-inch format. The milled, polished wheels sport five sets of three spokes that are as visually unique and striking as the wheels of the Golf GTI (“Denver”) and offer a very attractive view of the large 17-inch braking system with its glossy black calipers and R-logo. As an option, Volkswagen is also offering a 19-inch version of the “Talladega” wheels (named after a US race course). Like the brake calipers, the outside mirrors of the Scirocco R are always painted a glossy black, independent of the car color. Sport seat system with seat covers in “Kyalami” fabric weave (named after the Formula-1 race course in South Africa), with R-Logo on the front head restraints in “Art Grey”. Inner surface of contoured seat side supports has crystal gray microfibers. Unique aluminum decor inserts in the instruments. High-gloss black accents in the center console area, door handles, gearshift grip, air vents and steering wheel spokes. Parking brake grip and gearshift trim in leather, with “Art Grey” decorative seams. Floor mat inserts are also in “Art Grey”. Aluminum tread plates with R-Logo worked in. Instruments with white backlighting and blue pointers and speedometer indicator up to 300 km/h. Multifunctional leather steering wheel, flat-bottomed, in R-design (three spokes, perforated leather in upper and lower third, grip recesses right and left), with “Art Grey” decorative seams, R-logo in the lower steering wheel spoke and multifunctional keys in the steering wheel’s cross spokes. When the Scirocco R is ordered as a DSG version, the steering wheel is equipped with shift paddles (+/-). Bi-xenon headlights including static curve lighting, dynamic headlight leveling control, headlight cleaning system and warning lamp for low washer fluid level. Automatic climate control (“Climatronic”) with separate left and right controls, plus automatic recirculation switching. “RCD 310” Radio-CD system (4 x 20 Watt) with eight loudspeakers, CD player, MP3 playback function with title display, dual tuner with phase diversity for best possible radio reception and AUX-IN multimedia socket in the center console. Light and Sight package with two lights in the front footwells, automatic running light switching (including “Coming home” and “Leaving home” functions, automatically dimming rearview mirror and rain sensor. I wonder whether the decision not to go AWD wasn’t politically driven, so as to not encroach too much on TT-S and S3 territory at a much cheaper price. Still with that engine and that weight, in-gear performance should be rapid! Yeah, that’s a good point Revhed. However, I hope the Golf GTI-R (or whatever it will be called) does get AWD. You would think, given the two previous . :R model Golfs had 4motion, that this hotter GTI will too. That thing looks unreal. Much better without the black strips down the side. C’mon VW aus, I’d even settle for the 1.4! That is so gorgeous. Shame my partner doesnt like it.She thinks it looks too aggressive and angry. I dont think she gets it. Very nice! Shame about the lack of AWD. Looks very serious on the road and heaps better than the GTI. any? Kindly permit me know so that I may just subscribe. Thanks.